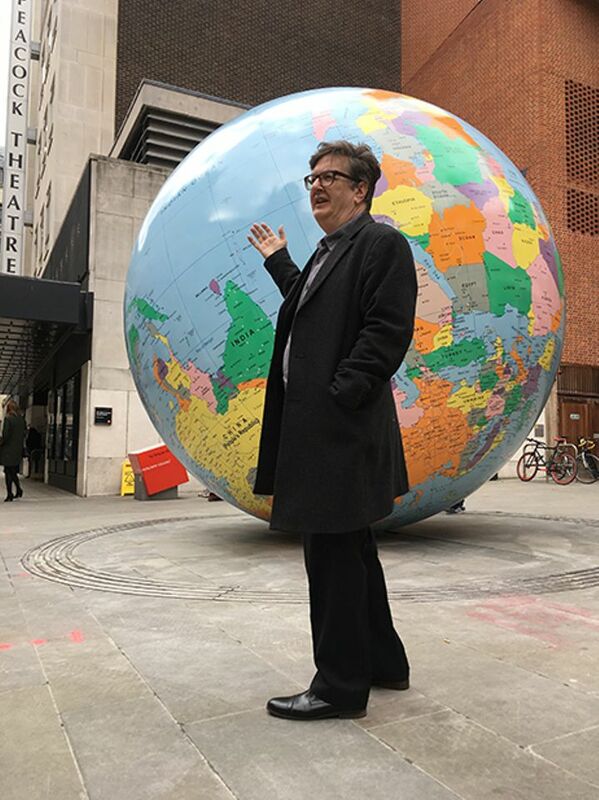 Mark Wallinger’s giant public sculpture unveiled yesterday morning on the central London campus of the London School of Economics uses immediate impact and a characteristically light touch to make serious points about the current status-quo. The World Turned Upside Down is just that, a giant inverted 4-m-high globe that sits on the North Pole with Antarctica at its summit. Countries, cities and oceans have all been re-labelled to be read from this new orientation. Of course this image of what Wallinger describes as “the world from a different viewpoint: familiar, strange and subject to change” chimes especially loudly with current upheavals. It is also a fitting work to be commissioned by the LSE, reflecting its international intake, global reach and commitment to progressive points of view. The title of Wallinger's work comes from a ballad of the English Revolution, and appropriately he chose to end his unveiling speech with a 370-year-old rallying cry from the Leveller’s Manifesto. Here he called for “the world to become a common treasury” and for “no man to seek dominion over others”, underlining that there is nothing new about the desire to topple hierarchies and apply new perspectives to existing political orders.